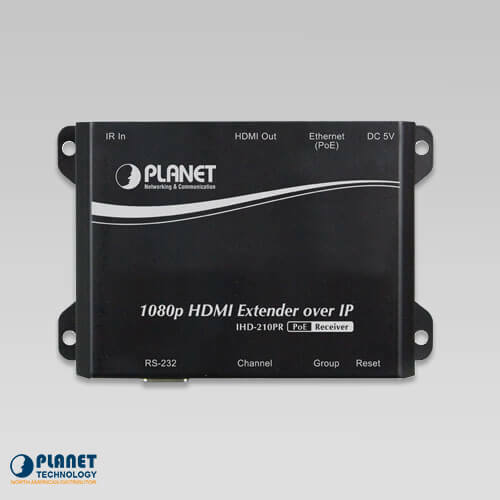 PLANET’s IHD-210PR HDMI extender receiver over IP with PoE delivers a great full-HD video distribution solution such as bringing an efficient and effective advertising deployment to high definition digital signage. 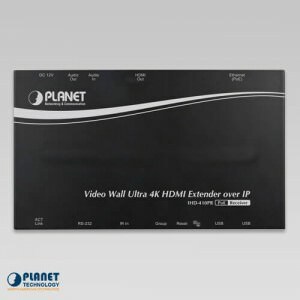 PLANET’s IHD-210PR HDMI extender receiver over IP with PoE delivers a great full-HD video distribution solution such as bringing an efficient and effective advertising deployment to high definition digital signage. The IHD-210 series is the combination of the transmitter, IHD-210PT, and the receiver, IHD-210PR. 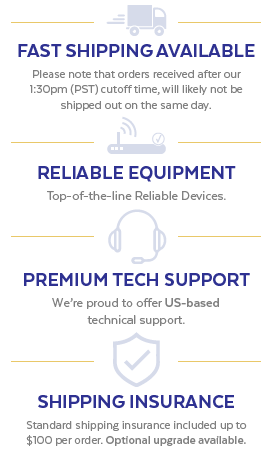 They can distribute HD digital content from multiple sources to practically any number of remote displays on a LAN and deliver ultra high-quality 1080p HDMI video broadcast over IP network. It offers vivid 1080p full motion video and also ensures sharp images and text for easy viewing. 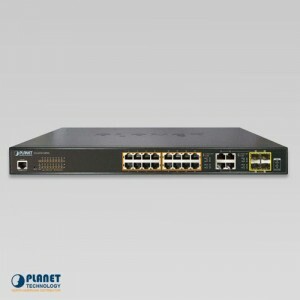 By cascading multiple Ethernet switches as the backbone of the IHD-210 series, it allows displays to be distributed far away from the source devices while sustaining consistent 1080p video and audio quality. The video sources can be rack centralized, decentralized or even a mixture of both. 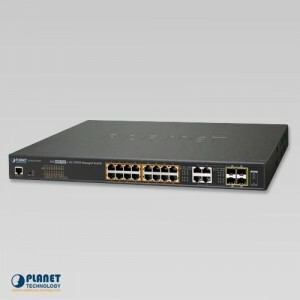 It thus increases the flexibility, scope and scalability of audio and video distribution via Ethernet networks. 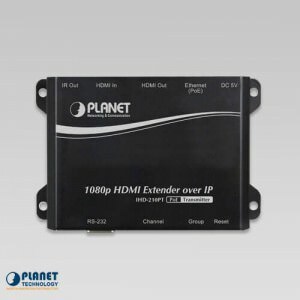 The IHD-210 series is a perfect solution for audio and video signal extension via the existing LAN. 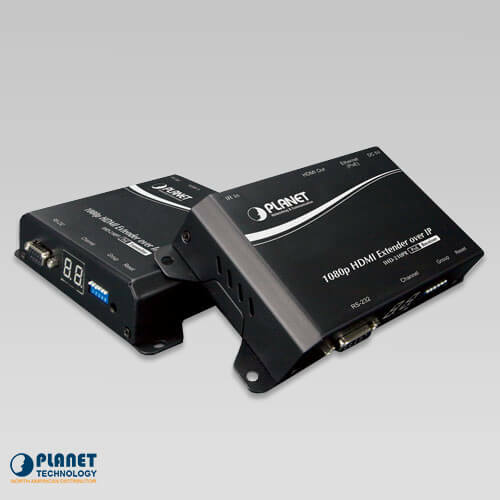 The IR transmitter and receiver interface allows users to control the video source at the terminal destination. 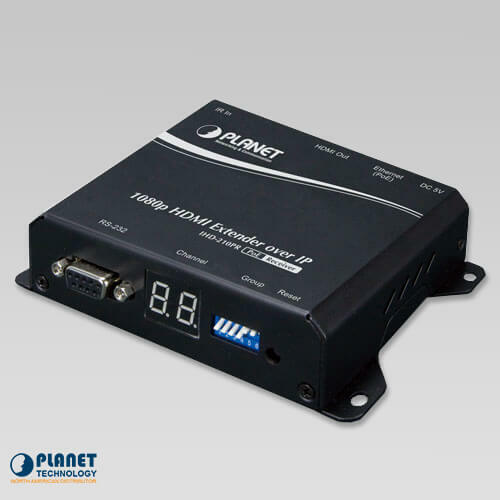 The IHD-210 series also features bi-directional IR extension and RS232 pass-through allows the user to cascade the system enabling them to extend the transmission distance without signal loss or delay. 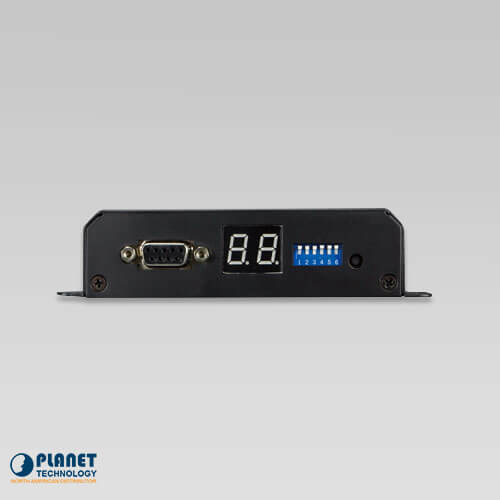 Its numerical LED indication enables users to recognize immediately the current group ID. It also supports HDMI Local Output function for checking video source conveniently. With the PoE function, there is no additional power supply needed, and the IHD-210 series thus reduces the complexity of cable installation. Installing one IHD-210PT at a local site can drive multiple IHD-210PRs at remote sites without consuming extra network loading. 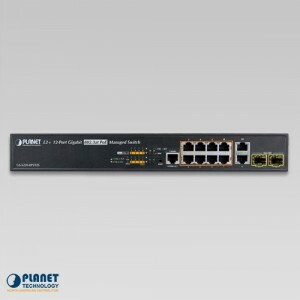 Integrated with a built-in IGMP snooping PoE switch, there are 64 channels selectable via the IHD-210 series, so video and audio can be transmitted simultaneously. 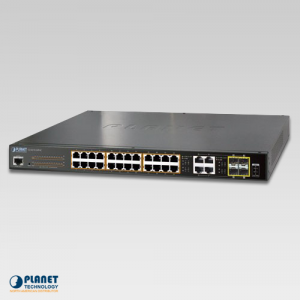 IGMP snooping is an integral part of IP multicast and a communications protocol used by hosts and adjacent routers on IP networks to establish multicast group memberships. IGMP snooping can be used for one-to-many/many-to-many networking applications such as online streaming video and gaming, and allows exclusive transmission and more efficient use of resources. The IHD-210 series adopts Automatic EDID (Extended Display Identification Data) Copy function to make smooth video distribution over different types of display units. 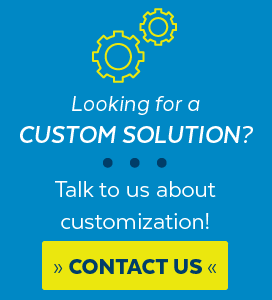 EDID is greatly important as it contains information about resources’ manufacturer names, serial numbers, product types, maximum image sizes, color characteristics, factory pre-set timings, frequency range limits, etc. In some cases, display problems may occur due to incorrect EDID communication between the display monitor and the transmitting unit or inappropriate EDID data programmed by display manufacturers. Therefore, with Automatic EDID Copy function, the IHD-210 series allows the system to copy EDID information from EDID compliant displays and assures accurate display performance. 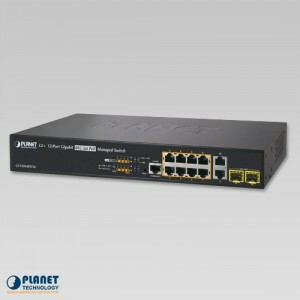 The IHD-210 series network can be configured by a central computer over the same LAN within a certain distance. Fully leveraging the mature Ethernet switches with 802.1Q VLAN function, multi-casting can be performed to allow more video sources/senders in the network and be remotely managed. Just adjust and match video channel setting with the simple DIP switch in both the IHD-210PT and IHD-210PR. 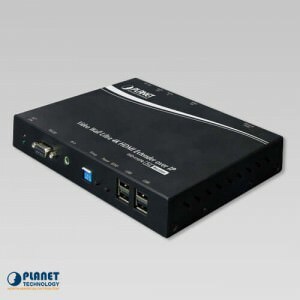 The video distribution is easily deployed through Plug and Play. The IHD-210 series supports Full HD 1080p, HDCP and Blu-ray quality, which have been commonly used for applications that require real-time high video resolution and transmission in long distance. 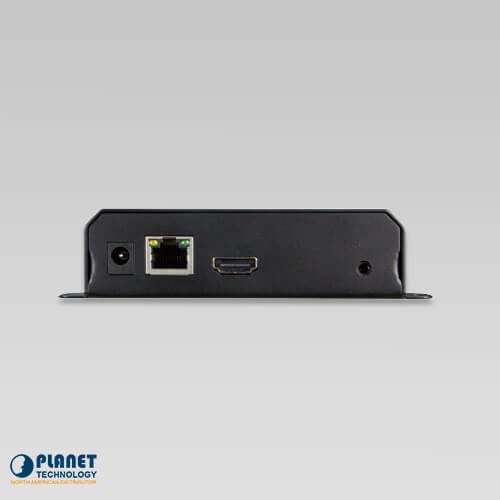 It also includes security and noise immunity as well as HDMI with 2-ch uncompressed audio function to offer the superior video distribution. Compression H.264 format for video encoder/decoder. 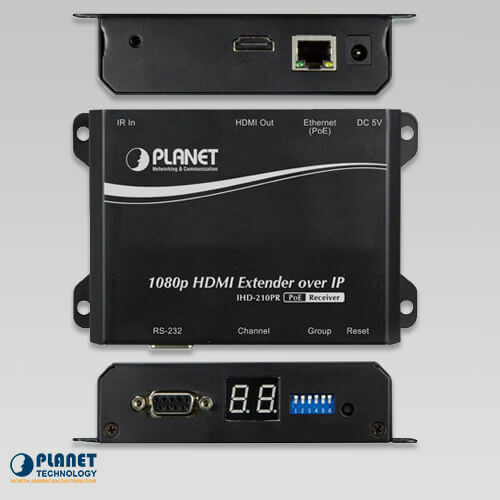 PLANET’s IHD-210PT HDMI Extender over IP transmitter with PoE delivers a great Full-HD video distribution solution such as bringing an efficient and effective advertising deployment for digital signage.